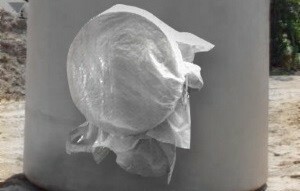 Our re-usable and lockable confined space control covers area new and revolutionary product that gives the company 100% control of their confined space. 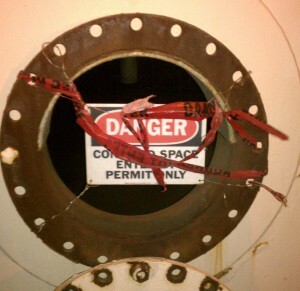 Imagine being able to protect the entry of a confined space just by incorporating our cover with your current lockout/tagout procedure and never having to worry about an unmanned, open vessel being illegally breached again. As you know this is extremely important – especially when plants are in turn-around & numerous vessels are open & left unattended. Even with today’s Standard Operating Procedures, Company guidelines & OSHA’s confined space requirements, injuries and deaths still occur. 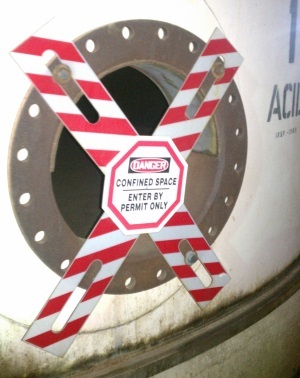 By placing our lockable barrier on a confined space entry, there is no possibility for a breach of any kind. 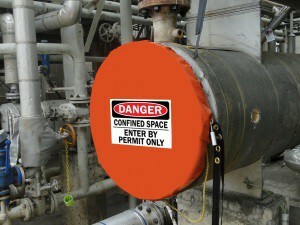 Not only will your company have documentation that the confined space is secured, you will also have peace of mind knowing that there can be no unauthorized access into your confined space ever again – thus, meeting and exceeding OSHA’s requirements for confined space labeling and barrier protection.